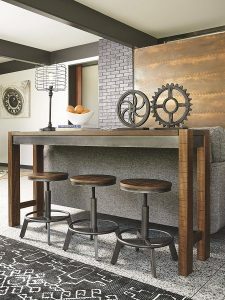 The Signature Design Torjin is a counter height urban industrial-chic style barstool designed by Ashley Furniture. It is offered as a set of two barstools with very cool look and feel. On the same Amazon product page you have two other options, to get the set of four vintage casual counter height Pinnadel retro inspired barstools or the pub height version of the same model. The difference between the two is mainly the height: 29.75” versus 26” and only 0.25” extra width and depth. You can use the Torjin in your kitchen or living room or dining room, near your couch or table as extra seats. 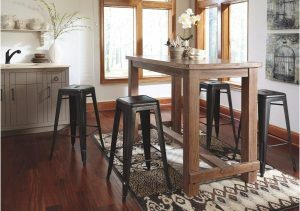 These height adjustable two stools have the sturdy metal base with footrest and engineered wood and veneers at the top. Grey and brown two-tone finish, urban industrial design with the planked look of the seat will add nicely to any decor. The Pinnadel retro stools are made of solid metal and in a dark grey finish. Each Torjin barstool measures 19W x 19D x 25H inches. You’ll need to do some assembly when you get the set to your address, but shouldn’t be too hard with the instructions and tools included in the box. Pinnadel stools are shipped assembled and you don’t need to do any extra work. Ashley Furniture has a variety of home products including furniture, mattresses, rugs, accessories and lighting for different tastes and at different price ranges. For the reasonable price level of these stools they are very sturdy and durable. When you adjust them for height or move them around they don’t make any noise. If they get squeaky later on you can use some oil to make them quieter. You can adjust the stool height between 18.5 and 25 inches from the floor to the top of the wood seat. It is great that you can make them higher for a bar and lower for sitting at a desk or a table. The retro inspired Pinnadel are dark grey but look black in the photos an in different light. The two stools can also have slightly different colors in some cases. The barstools are only in pairs and you can’t purchase just one. With the metal bases they should be able to hold user weights up to around 300 pounds comfortably. If the stool feet are not level you can use the little screws at the bottom to make them level and prevent and wobbling. These stools are comfy to sit on, but not for a very long time unless you put a cushion on them. They are easy to keep clean as you can wipe them with a dry or damp rag. To sum up, they are definitely worth looking into if you have the budget.